The attorneys at The Law Office of David Goldman PLLC have created a Florida Enhanced Life Estate Deed, which is also known informally as Florida “Lady Bird” deed. The Florida Enhanced Life Estate Deed is a great estate planning tool because it allows a person to qualify for Medicaid and keep the homestead. Often using a regular life estate deed can disqualify a person from long-term government assistance. A Florida enhanced life estate deed is similar to a traditional life estate deed but has some key distinctions. Think of a life estate deed as a type of payable on death bank account. The person that owns the home has a life estate interest in the house. This means that he or she can live and use the house for the rest of that person’s life. In Florida, a homestead is usually an exempt asset if a person needs Medicaid or nursing home assistance. Once this person dies, the house automatically transfers to a beneficiary without the need to spend thousands to open a probate for the home, which is just like how a payable on death account works. A house that transfers through a life estate deed completely avoids probate, so there is no court administration needed. The life estate deed states what person will receive the house when the deed’s creator passes away. While the deed’s creator is alive, the beneficiary is known as the remainderman. This person has a contingent or “remaining” interest in the house but no interest while the life estate holder is alive. Probate is the court administration of a person’s estate, which eventually passes the decedent’s property to his or her creditors and then to his or her heirs. 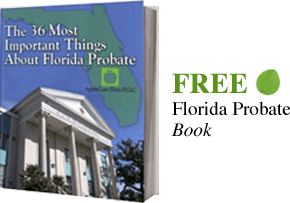 Probate in Florida can be a long process that takes anywhere from a few months to years. The probate court has to appoint a personal representative, send creditors and beneficiaries notice, and account for all of the decedent’s property before the court orders the property to be dispersed. If the property owner has no Will, then the house would pass according to intestate succession. Intestate succession is when the probate court distributes the decedent’s property according to Florida statutes. These statutes create a priority list of family members, which means only certain family members will receive the decedent’s property. This can also mean that certain family members do not receive anything all. For instance, a stepchild is not likely to receive any property through intestate succession if natural children are alive. Another problem with the traditional life estate is that the life estate holder loses power once he or she creates this deed. The life estate owner can no longer mortgage the property or make other decisions regarding the property without the consent of the remainderman because this person has a remaining future interest in the property. The Florida enhanced life estate deed allows the estate holder to convey or mortgage the property without approval of the remainderman. This gives the property owner of the life estate flexibility during the owner’s life. Even with the added flexibility, the law still allows the deed to transfer the house to the beneficiary after the creator dies. However, if the remainderman dies before the life estate holder, the same problem remains unless you deal with that in the deed. While many enhanced life estate deeds do not address this problem, a properly drafted enhanced life estate deed can be drafted to anticipate this possibility and deal with the potential problem. One of the main benefits of the ladybird or enhanced life estate deed in Florida is that the deed permits the owner of the house to qualify for Medicaid in Florida and avoid probate. Medicaid is extremely hard to be eligible for in this state. The Medicaid applicant must pass a means test and an asset test. These tests do not allow a person that makes too much income or a person that owns too many assets to qualify for Medicaid. Typically, Medicaid does not count a person’s homestead against the individual in the asset test. However, households over a particular value are counted as part of the test, which can disqualify a person from receiving Medicaid. Sometimes with preplanning a portion of a person’s home which would be more than the permissible value can be transferred to a trust or another individual and then the Lady Bird deed can distribute the remaining value after death. This can help people qualify for Medicaid who would otherwise have to sell his or her house. Medicaid is a government program that provides Florida residents with long-term health care coverage. Without Medicaid, health care services such as nursing homes are quite expensive and can cost tens of thousands of dollars a month. Studies show that up to 70% or people over 65 will need this type of long-term care before they die. This care can quickly eat through a person’s savings and is likely to decimate the value of an estate. Suddenly, the wealth someone has saved their entire lives to leave to loved ones is gone in a few years to pay for long-term care. Some Enhanced Life Estate Deeds still require probate as the deeds do not meet some insurance companies requirements. We have seen this problem with many online deeds which do not deal with contingencies appropriately. Even worse, a poorly drafted enhanced life estate deed may expose a protected asset to creditors. If you already have a Lady Bird Deed, it is imperative to have an estate planning attorney review the document. The attorneys at this firm have reviewed Enhanced Life Estate Deeds that subject the property to the claims of creditors. SuperLawyers ranked The Law Office of David Goldman PLLC as one of the top estate planning firms in the Jacksonville area. The Florida Enhanced Life Estate Deed can be a great tool at the disposal of the attorneys. This deed can help our clients avoid probate, protect from transfers that would disqualify them from benefits, and gives the life estate owner the full use of his or her property. This right includes the holder’s right to sell the property interest or to mortgage the property. A Florida Enhanced Life Estate Deed can help avoid probate, speed up the transfer of a property upon death, maintain the ability to use the fair market value of the property at the time of death as a cost basis (lowers income taxes upon sale), and maintain Medicaid eligibility. When is a Florida Enhanced Life Estate a Bad Idea? There are situations when an Enhanced life estate deed is a bad idea. One example is if there is a large mortgage on the property. The tax stamps on the deed may be prohibitively expensive. Before rushing in to get a deed like this, you should have a Florida estate planning lawyer review your situation to determine if this tool is right for your situation. TO SET UP A Free Consultation*, CONTACT A FLORIDA ENHANCED LIFE ESTATE DEED LAWYER ONLINE OR CALL US AT(904) 685-1200. Does the Ladybird Deed Enjoy Homestead Protection? A Florida Ladybird deed has become one of the increasingly most used estate planning tools by the some of best Jacksonville estate planning attorneys.